Many companies are turning to nature for inspiration for tackling the world’s challenges. By mimicking natural designs millions of years in the making, we are learning how to reduce energy consumption and resource depletion, implement self-regulating cleaning methods, and advance technology in new and creative ways. Innovation based on the designs found in nature is referred to as biomimicry. Biomimicry is a relatively new field of study that is enticing engineers, biologists, and conservationists to work towards a common goal of overcoming technological challenges and maintaining global sustainability. When attempting to solve a problem, such as the booming sound caused when a Japanese bullet train blasted away from the station, researchers sought solutions in the animal kingdom. In the case of the bullet train, engineers reshaped the nose of the train to emulate a kingfisher, which allowed it to enter the station soundlessly, like a kingfisher diving into the water after its prey. This modification to the structure of the train also reduced the energy use of the train by 30 percent. A Shinkansen 500 series train pulls into Japan’s Tokyo Station. The shape of the train’s nose was inspired, in part, by a kingfisher’s bill. Credits: A belted kingfisher (Megaceryle alcyon), courtesy of Michael Liskay via birdseye.photo. A Shinkansen 500 series train, via Wikimedia Commons. 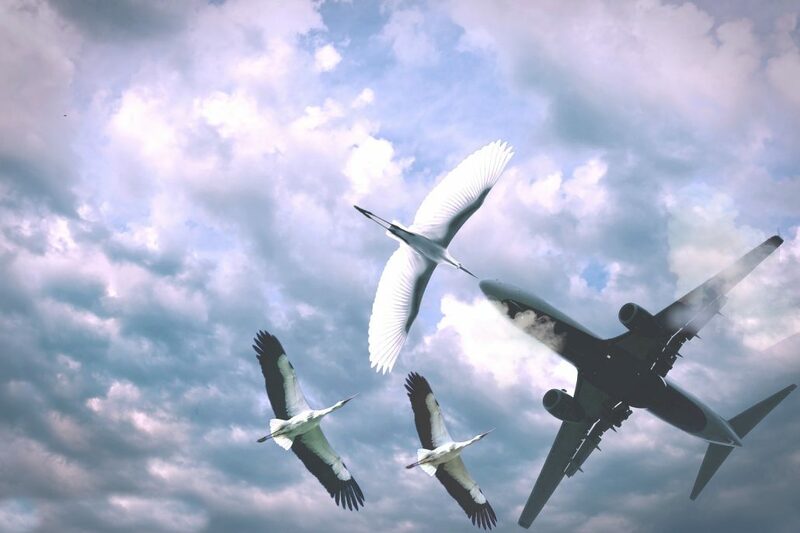 Another example of how birds can offer insight into reducing energy use is happening in the world of aeronautics. Scientists have discovered that birds flying in a V-shape reduces the amount of energy that is being exerted by each individual bird. When a bird towards the front of the V flaps its wings, it creates an updraft, lifting the bird behind it. The birds within the group rotate so that each has the opportunity to work harder for the group by being in the front while also having a chance to rest in the back of the formation. A group of researchers at Stanford University are planning a study that will follow commercial airliners on transcontinental flights while they fly in a V-formation with other airplanes. Their hypothesis is that the jets will use 15 percent less fuel when they simulate the pattern of birds, as opposed to flying alone. Biomimicry can also be built into our architectural designs by nurturing mutually beneficial relationships found in nature. Birds have symbiotic relationships with many different animals, including horses. Birds feed on the insects that plague horses, while horses offer a safe resting spot and nest building materials for birds. Sustainable barns that offer numerous natural entrances can benefit both domesticated animals as well as the wild ones with whom they interact. By implementing changes such as the Japanese bullet train and jetliner examples, humans are creating change that reduces fossil fuel consumption and improves industrial design. However, there are always problems with innovation. Humans are bound to make errors in our attempts to mimic nature. Wind turbines, a valuable renewable energy resource, imitate the shape of an owl’s wing to improve energy efficiency, but the reduced noise and ease with which they slice through the air have made them more lethal to bird populations. As we move forward in our innovation and face technological challenges, we must look further into the future and the impact that biomimicry may have. We must support innovation that benefits from nature, but more importantly, we must support innovators that benefit nature. The ways in which we can learn from birds could be endless and found in the depths of remote places like the tropical rainforests of Asia and South America. During your next birding session be sure to look for other ways we could be using knowledge about birds to solve technological challenges. Read more by Avery Phillips on Medium and follow her on Twitter.